This prototype covert surveillance robot has been tested in demonstrations that show off its ability to map its surroundings and to seek hiding places when it hears approaching sentries. 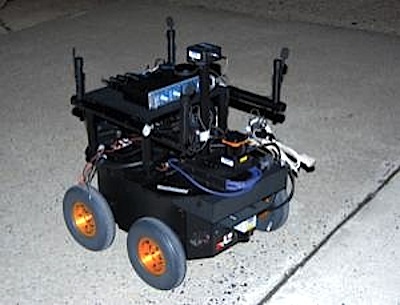 Lead engineer Brian Satterfield says the robot was designed to operate within four constraints: "Avoiding visible detection by sentries of known locations, avoiding potential detection by sentries whose positions were unknown, avoiding areas in which the robot would have no means of escape, and, as this robot was designed to run at night, avoiding areas that were well lit." To make it hard to spot in the dark, the robot was painted black. Researchers at Seoul National University are also working on this concept; see Sneaky Robots Are Right Around The Corner for details. His attention fixed itself on the pack of juveniles. They were here, the earwig-like sleuths. Each juvenile was a foot and a half long. The species scuttled close to the ground - or up vertical surfaces - at ferocious speed, and they noticed everything.